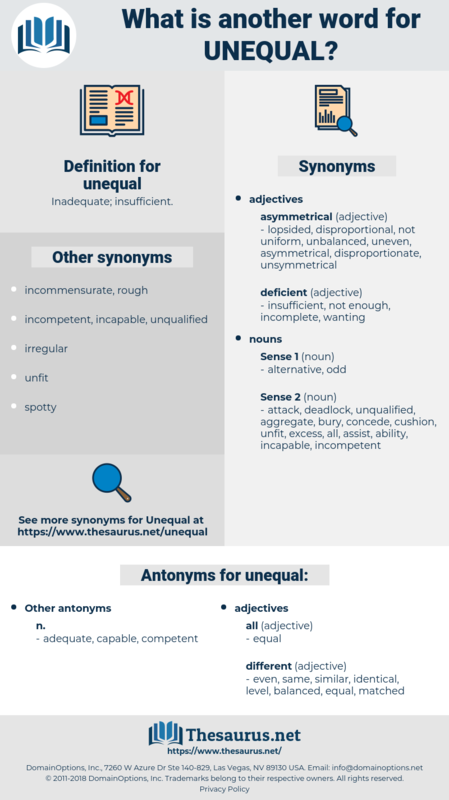 What is another word for unequal? march to a different drummer. 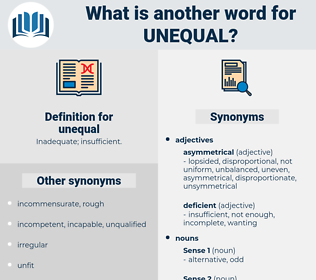 disproportionate, asymmetrical, unjust, lopsided, patchy, inconsistent, ragged, mixed, skewed, discriminatory, different, unfairness, asymmetric, varied, spotty, disadvantaged, inegalitarian, variable, equitable, one-sided, unjustified, unstable, differentiated, erratic. unfair, unbalanced, imbalanced, iniquitous, disparate, dissimilar. even, matched, same, level, similar, identical, balanced. quits, Isoclinic, unchanging, regular, changeless, unvarying, stable, half-and-half, steady, constant, Isoclinal.
" After you had left me and had gone back to England," he continued, " I used to wonder if I had done wisely or well in refusing you your heart's desire; now I know that I did well, for unequal marriages never prosper. He was extremely anxious to live on the most friendly terms with his " good brother," and begged him, as the first token of equal goodwill, to dismiss the counsellors who had hurried him into the present unjust and unequal war.